i had forgotten how hard it was to cycle to school...im shattered! we've moved into a temp kitchen at work whilst construction takes pace aove the exisitng resteraunt. The new place is 5HI7! seriously, its cramped badly designed and just cr4p. we even had a power cut yesterday (just in the kitchen you understand, not in the hospital) so all the freezers and cookers shut down and everything. man. at least im only there for another few weeks. dayum. oh well, at least i got three days off. today, tomorrow and saturday. today i took down the ole xmas decs and then did the whole school thing. tomorrow is my birthday! w00t! i hve no cdd for you today (although there is one in the pipeline) but instead its the return of RANDOM PICTURES!!! 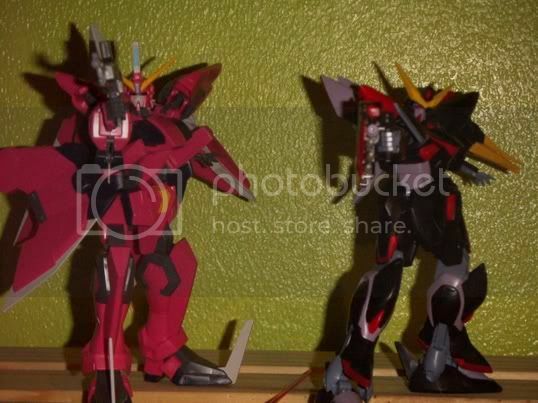 Today i have piccies of my 1/100 Gundam SEED plamos! 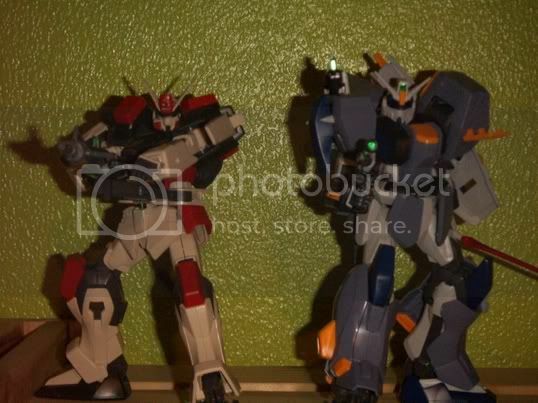 Buster and my newly acquired Duel.